We got our 8m x 5m steel shed delivered and erected on Wednesday. The base for the shed was slighly out of kilter due the heavy rain causing the filled ground to settle. The crew were outstanding. At no point did they make a big deal out of this and fitted steel shunts so that the shed would sit properly on the base. 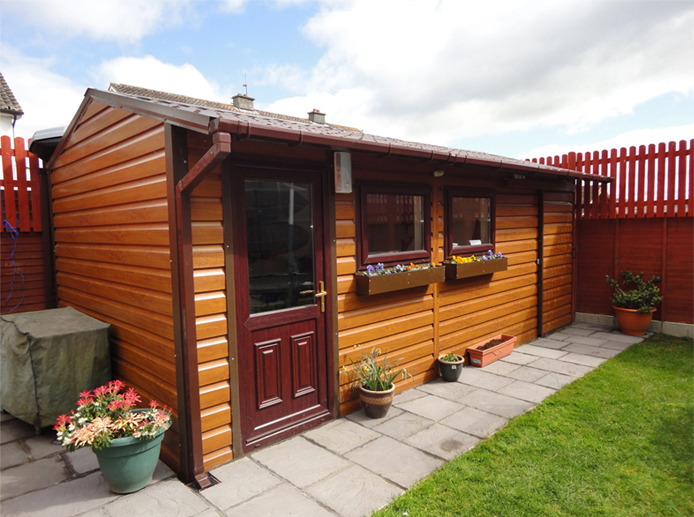 We ordered our shed through Mary Cummins in the Bishopstown office. 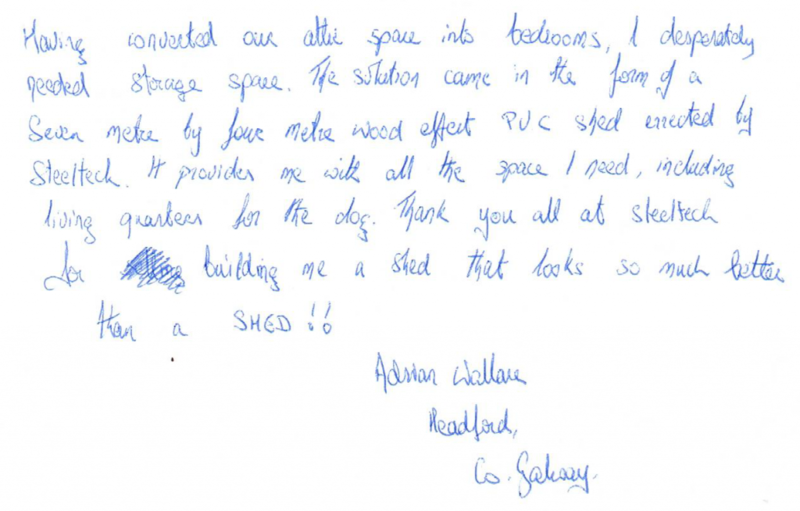 Mary was a pleasure to deal with and is very knowledgeable and advised on the shed to suit the purpose. No changes or additions to the original order were an issue after the order had been put through. I would highly recommend SteelTech Sheds to everyone. Very professional people to deal with and shed quality and build is of the highest standard. They arrived yesterday (Saturday) morning at 7.45am and were gone by 4.00pm that afternoon. I took a number of photos during the construction, some of which I include as attachment files, 21 files in all. They did a great job and are a credit to your company. They knew what they were about, no mess, no fuss, they just got on with the job in hand. Once again thanks for a job well done. It was easy to make up my mind, they are a lovely shed! I was looking for a garage/workshop/storage shed for a while, I called to Ballyseedy Garden Centre to look at “Steeltech Sheds”. The guy I met was just brillant, he explained everything about the Steeltech’s Sheds, his name was Ger Sheridan, a gentleman he was not pushy but showed all the diferent sheds, explained all the workings and finishings etc, it was easy to make up my mind, they are a lovely shed, I bought a Steeltech Shed 8m x 4m, it was delivered and and constructed by three outstandind guys, no messing. Steeltech thank’s, you should be proud of your workforce, they are a credit to you, from start to finish everyone that I dealt with was manerly, knew their job and did it well. Very professional and courteous at all times! Hi Lads, I got a shed from you during the week in Waterford. I just said I would drop a quick message to you. The Shed is great, but the main reason I am getting in touch is to complement the 3 men that came to fit the shed. They wasted no time, worked so fast, great attitude and manners and are a credit to your company. Well done. Got a 4m x 3m shed last July 2011, all very painless and efficient. Had a small problem with a door lock May 2012, contacted the Galway office and all was sorted – no fuss, no bother, no cost. I didn’t even have to be there. Just a very good and pleasant after sales service. Just to say the shed I got from your cork office 18 month ago is going great. The advice you gave me was perfect. I wish to confirm that the shed has been installed. We would like to thank you for the prompt delivery service and to compliment you on the professional and positive manner in our dealings with you after loosing our deposit with a different Shed company. From the outset Simon & David in the Galway branch were very professional and customer focused. Special requests were accomodated without any fuss. The erectors were also very professional – overall a good experience. Having converted our attic space into bedrooms, I desperately needed storage space. The solution came in the form of a seven metre by four metre wood effect P.V.C Shed erected by Steeltech. It provides me with all the space I need, including living quarters for the dog. Thank you all at steeltech for building me a shed that looks so much better than a shed! “Without Steeltech I probably would never have got my business off the ground. I couldn’t have afforded to rent an space, so building a structure in my garden was the only option, and my budget was limited. My steel office/workshop was erected in a couple of days, fitted out, and now I’m up and running in a warm and cosy space, which didn’t cost the earth. Steeltech’s staff were also very professional and knowledgeable, and made the experience a pleasure”. 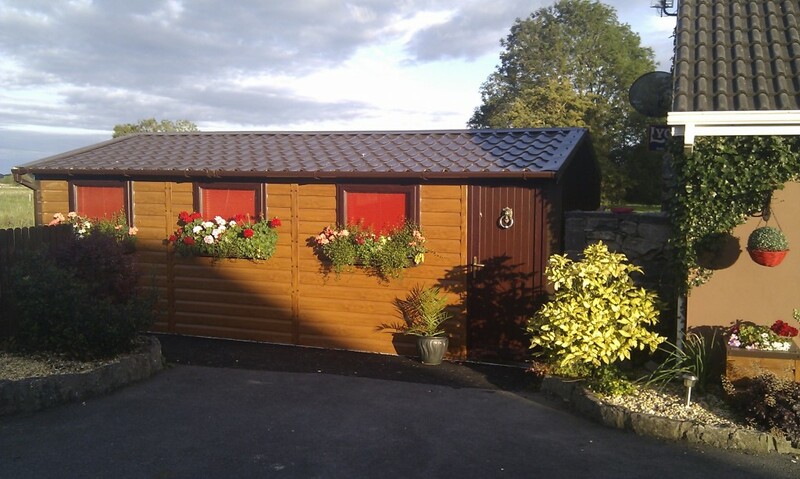 Would you like to leave feedback on the quality of your Steeltech Shed and the service provided by our team? Enter your details and testimonial below and we will publish it on our website! We won't publish your address, only your area! Upload a photo of your Steeltech Shed full to the brim, with your kids playing Snooker in it or anything you think is a bit unique and we will publish it beside your testimonial!